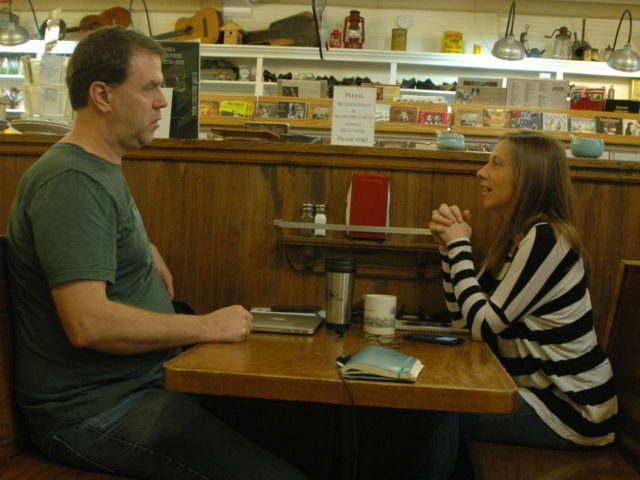 Ashley Hanson interviews Dylan Locke at The Floyd Country Store in Flyd, VA (pop. 432) after participating in a Bluegrass Jam Session, which happens at the store every Sunday afternoon. On January 4th, Ashley took off from the West Coast in a little yellow school bus, along with her Golden Retriever Bodie, on a five-week cross country road-trip conducting interviews, creating art, and documenting the journey with audio, video, and photos. Along with partners, Springboard for the Arts, Creative Exchange, and Art of the Rural, Ashley hopes to shed light on the incredible work rural-based artists, cultural leaders, and arts organizations are doing at the intersection of art and community development. So far, she has visited artists in Del Rey, CA; Ajo, AZ; Show Low, AZ; Zuni Pueblo, NM; Santa Ana Pueblo, NM; Albany, TX; Edom, TX; Fayetteville, TX; Arnaudville, LA; Summit, MS; Newbern, AL; Denmark, SC; Lake City, LC; Flyd, VA; Whitesburg, KY – all communities with populations under 10,000 – the majority of theses communities with a population under 2,500. 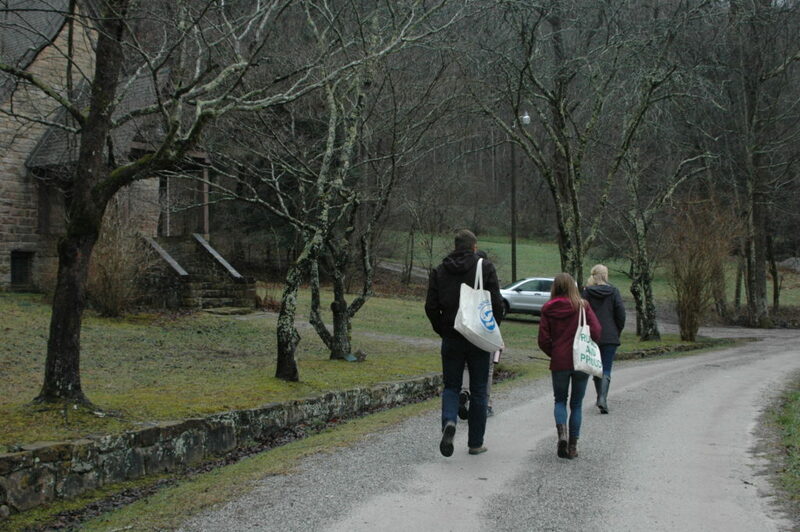 Ashley Hanson takes tours Pine Mountain Settlement School with Geoff Marietta and Megan Epperson in Big Laurel, KY. She also visited Appalshop and Higher Ground in Eastern Kentucky. Public Transformation is a cross-country documentary art project highlighting the work rural artists and arts organizations are doing to make their communities a more vibrant, healthy, connected place to live. After the election, which brought to light major divides in our country between urban and rural areas, Minnesota artist Ashley Hanson, purchased a little yellow school bus and began planning a trip from West to East, North to South to document and share stories of the work being done in rural communities with a national audience and to further connect rural practitioners across the country to each other. In addition to being a documentary art project, Public Transformation is also a mobile artist residency. During the five-week journey, artists will join Ashley to create work about their experiences in these communities. Upon completion of the trip on February 6, all of the stories and works of art will be compiled into a multi-media exhibition that will be showcased at the Rural Arts & Culture Summit in Morris, MN June 6-8, 2017 and at Art of the Rural’s headquarters the Outpost in Winona, MN in July. The exhibition will be designed to facilitate conversation about the role of arts in rural community development and will seek to be useful for artists, organizers, planners, or anyone living in and working with rural communities. Additional artists will contribute to the project remotely and in collaboration with Ashley following the road-trip. These artists include citizen artist Mary Rothlisberger (Washington), writers Michele Anderson (Fergus Falls, MN) and Matthew Fluharty (Winona, MN), musician Brian Laidlaw (Denver, CO), and playwright Jessica Huang (Minneapolis). Public Transformation invites you to follow the journey. 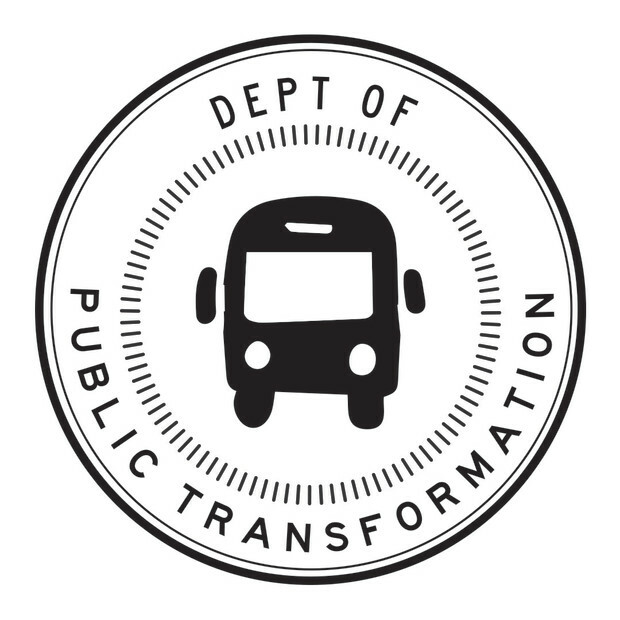 Visit www.publictransformation.org to see updates from the road and become a member of the Department of Public Transformation. You can also follow Public Transformation on social media @publictransformation, #publictransformation. Public Transformation is supported by Springboard for the Arts, Creative Exchange, Art of the Rural and many generous individual donors. Public Transformation is a cross-country documentary art project highlighting the work rural-based artists and arts organizations are doing to make their communities a more vibrant, healthy, connected place to live. Ashley Hanson’s little yellow school bus will act as a mobile artist residency to document and share stories of the great work being done in rural communities with a national audience and to further connect rural practitioners across the country to each other.